Funny, we thought only an Aussie could love our Ugg boots. Now that some celebrities have turned our ugly boots into a fashion statement, they’ve become a hit around the world. Ugly? Well, yes, that’s why we call them Ugg boots … short for ugly. Fair dinkum. The boot was originally created for warmth and comfort. It’s basically a sheepskin turned inside out and made into a boot. Most people wear them barefoot. Ugg boots are like your favourite pair of sneakers. They may be old and grungy, but you can’t bear to throw them out. Some people are so fond of their boots that they wear them until they fall apart. However, today this Aussie icon is in danger of becoming lost. An Australian surfer, Brian Smith, started a small Australian footwear company called Ugg Holdings in California in the 1970s and trademarked the term Ugg, as well as variations such as ug, ugh and so on. Those USA trademarks are what all the fuss is about. In 1995 Deckers Outdoor bought Ugg Holdings and now own the Ugg trademarks and believe that anyone selling boots and calling them Ugg are in trademark violation. That’s News to the Aussies. 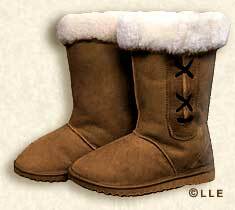 Aussies have been making and selling Ugg boots since at least the 1950s and some say as early as World War I. So why didn’t anyone trademark the name? Why would we? No one trademarked the name sneakers. In Australia Ugg is the same thing. A generic term for your basic very ugly boot. No one much cared until the Ugg boot craze hit America. Prices soared and it was a fashion must-have. Our lowly Ugg boot is now selling overseas for well over US$ 300 a pair. Deckers Outdoor estimates they sold over 45 million US dollars worth in 1994. And they have plans to expand the market into Ugg handbags and other leather items. Very big bickies indeed! That’s why Deckers Outdoor is fighting to prevent Aussies and others from selling Ugg boots anywhere especially on the Internet. So far they’re winning. We’d hate to see another Aussie icon lost.